a claimed capacity of 6 qt. pre-programmed settings for cooking foods. cost about $4.15 to operate 1 hour per week for 52 weeks when set to 350°F. comes with a 1 yr warranty. 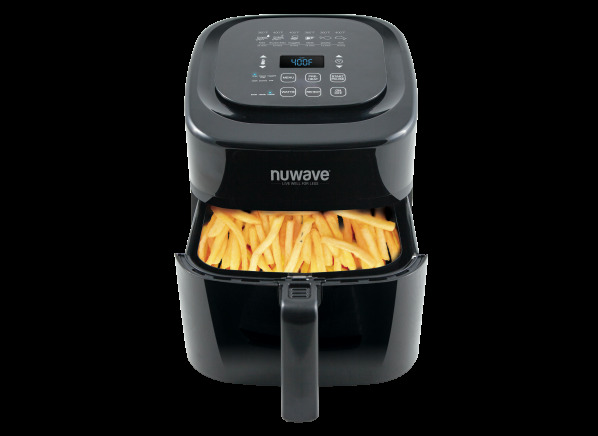 The NuWave 6-Qt 37001 is part of the Air Fryer test program at Consumer Reports. In our lab tests, Air Fryer models like the 6-Qt 37001 are rated on multiple criteria, such as those listed below. Controls: We consider legibility of markings and ease of setting desired time and temperature. Noise: Noise is measured with the appliance operated on a counter-top. Cleaning: Our assessment of cleaning the air fryer includes both baskets, the interior of the machine and exterior surfaces. Digital display Digital display Display has digital readout for easy reading. Dishwasher-safe Dishwasher-safe Dishwasher safe is based on the manufacturers' information. Pre-programmed settings Pre-programmed settings Comes with pre-programmed settings for cooking foods. Height (in.) Height The height of the air fryer rounded up. Width (in.) Width The width of the air fryer rounded up. Depth (in.) Depth The depth of the air fryer rounded up. Weight (lbs.) Weight Weight of the air fryer rounded to the nearest pound when empty. Claimed capacity Claimed capacity Capacity of air fryer as stated by manufacturer.